Most households have limited financial resources, and therefore want the best value for money on a limited budget. Fortunately, there is a wide range of toilets from all the major manufacturers in various designs at under $500. We reviewed some of the best. Both tank and bowl are protected by TOTO’s patented SanaGloss glaze, a high gloss ionized barrier that actively repels debris, bacteria, and mold. The seat is ergonomically designed for maximum comfort and is molded from high-impact polypropylene, a glossy plastic that can withstand harsh chemical cleaners. The ultra high-efficiency flush uses just 0.8 GPF. It is a pressure-assisted flush, meaning that there is a second pressurized tank inside of the water tank. The G-Max flushing system of this toilet manages a commercial grade flush, with a siphon jet flushing system that increases the pressure of the flush. The seat and supply line are not included in the installation kit. The product is WaterSense-certified and it carries a one-year limited warranty. The bowl and tank are protected by American Standard’s EverClean finish, which contains a glaze additive that prevents the build-up of bacteria, mold, and mildew. This modern two-piece toilet is available in glazed cotton white. It has a high-profile tank with a chrome-plated activation lever mounted on the side. The bowl is elongated. The seat is not included. Both tank and bowl are protected by TOTO’s patented SanaGloss glaze, a high gloss ionized barrier that actively repels debris, bacteria, and mold. This reduces the need to clean the toilet with damaging chemical cleaners, allowing the toilet to retain its gloss and bright color for years. The toilet is equipped with TOTO’s quiet and powerful G-Max flushing system. This system sports a three-inch flush valve—that’s 125% larger than regular flush valves. The flush valve is paired with a wide fully-glazed trapway. Together they produce a commercial grade flush that only uses 1.6 gallons of water per flush (GPF). This cotton white toilet has a one-piece construction. It has an elongated seat and high-profile tank. The chrome-plated flush activator is mounted on the side of the tank. The sleek design of this toilet, along with the one-piece construction, makes it easy to clean as there are no crevices that could harbor dirt or bacteria. The installation kit includes a SoftClose seat. This seat has been specially designed to prevent the seat from slamming. The hinges attached to the seat and lid are designed to close gently every time. The seat is ergonomically designed for maximum comfort and is molded from high-impact polypropylene, a glossy plastic that can withstand harsh chemical cleaners. The seat can be upgraded to include a washlet for personal hygiene. The toilet boasts TOTO’s G-max flush system. The G-Max system has a three-inch valve, which is 125% bigger than a standard flush valve. This together with the wide, glazed trapway is what gives this toilet its commercial grade flushing performance, creating a quieter, faster and more powerful flush on just 1.6 GPF. This product has a five-year warranty. 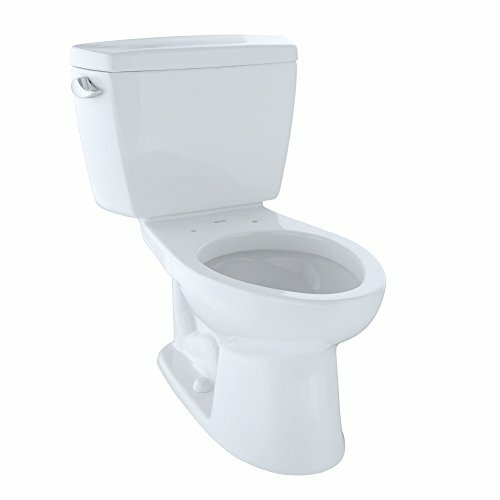 This toilet has a two-piece construction of vitreous china and is available in white. It has a high-profile tank with a top-mounted button. The elongated bowl offers maximum comfort; however, the seat is not included in the kit. At the bottom of the price range, this toilet is good value for money. The ultra high-efficiency flush uses just 0.8 GPF. It is a pressure-assisted flush, meaning that there is a second pressurized tank inside of the water tank. When the flush is activated, pressurized water is forced into the toilet resulting in a quiet, powerful and water-efficient flush. The toilet is WaterSense-certified. This universal height, two-piece toilet has an elongated bowl for maximum comfort. The cotton white toilet has a high-profile tank, and is equipped with a chrome-plated, side-mounted flush activation lever. The bowl and tank are constructed of vitreous china. The toilet is ADA-compliant. The installation kit does not include a seat, but it is worth noting that the toilet can be upgraded by adding a SoftClose seat and a washlet. The G-Max flushing system of this toilet manages a commercial grade flush, with a siphon jet flushing system that increases the pressure of the flush, and the three-inch flush valve is 125% bigger than the industry standard. This is paired with a wide, fully-glazed trapway to produce a flush that is quiet, powerful and fast. It uses 1.6 GPF. The product has a one-year limited warranty. This two-piece toilet has a standard height bowl. It has a high-profile tank with a rather unusual fluted design. The chrome plated flush activation lever is mounted on the side of the tank. The elongated bowl and tank are constructed of vitreous china. This product is equipped with Kohler’s Class Five flushing system. Boasting a 3.25-inch flush valve, this system uses just 1.28 GPF, whilst still boasting best-in-class bowl cleanliness. The seat and supply line are not included in the installation kit. The product is WaterSense-certified and it carries a one-year limited warranty. This toilet is a two-piece construction with a high-profile tank. It has a classic design with an elongated bowl. This is a Right Height toilet, meaning the seat is the same height as a standard chair, making it easier for adults to sit down and rise up from the seat. The bowl and tank are protected by American Standard’s EverClean finish, which contains a glaze additive that prevents the build-up of bacteria, mold, and mildew. Bacteria are known to cause odors and discolouration; EverClean will ensure that the toilet maintains its gloss and color over time. The seat is not included with the toilet but two color-matched bolt covers are. The top-mounted activation button allows the user to choose between a full or partial flush, using just 0.92 or 1.28 GPF. The toilet is equipped with siphon jet bowl technology and a PowerWash rim. This rim is pressurized keeping the water under pressure until the flush is activated and then drives the water right around the bowl. The cleaning action is assisted by the powerful siphon, leaving the toilet clean and streak free. This low-consumption toilet is WaterSense-certified. This product carries a limited lifetime warranty on the porcelain parts and limited five-year warranty on the mechanical parts. This toilet has a two-piece vitreous china construction, with a high profile tank. It has a round bowl so it is ideal for smaller spaces. The sleek classic design and glossy EverClean surface make it very easy to keep clean. EverClean contains a glaze additive that prevents the build-up of mold, mildew, and bacteria, which can cause odors and discolouration. It ensures that the porcelain retains its bright color and glossy finish over time. The Dual flush button mounted on the top of the tank offers the user the choice of partial or full flush that will use 0.92 or 1.28 GPF. The toilet boasts siphon jet flush technology with PowerWash rim. The rim has a pressure chamber, which keeps the water under pressure until the flush is activated and then uses the pressure to force water all over the bowl; the powerful siphon then removes the waste. This product is WaterSense-certified. There is no seat included with the purchase. This product has a limited lifetime warranty on the porcelain and limited five-year warranty on the mechanical parts. This very reasonably priced toilet has a two-piece vitreous china construction. It has a classic design with an elongated bowl. It is available in white and has a high profile, rounded tank with a chrome plated, front mounted flush actuator. This is a Right Height toilet. The seat is the same height as a standard chair, making it easier for adults to sit down and rise from the seat. The tank and bowl are protected by American Standard’s EverClean surface. This finish contains a glaze additive that prevents the build-up of mold, mildew, and bacteria, which can cause odors and discolouration. The protection offered by EverClean will ensure that the toilet retains its color and high gloss. The toilet boasts siphon jet bowl technology and a PowerWash rim. The water in the rim is kept under pressure, until the toilet is flushed and then this pressurized water is forced from the rim into all areas of the bowl surface, ensuring that the bowl is properly cleaned and streak free. The cleaning is assisted by the siphonic action of the bowl. The seat is not included in the pack. The product has a limited lifetime warranty on the porcelain components and a limited five-year warranty on mechanical parts. This modern sleek looking toilet has a skirted bowl. It is a one-piece construction with no grooves. This smooth and sleek design means that this toilet should require very little cleaning as there is nowhere for dirt or bacteria to accumulate. The bowl is elongated and the tank is low profile. This glossy white toilet is Comfort Height meaning that unlike standard toilets it is the same height as a chair. This makes it much easier for adults to sit on and rise from the seat. The activation button mounted on the top of the tank offers the user a choice of full or partial flush, using either 1.6 or 1 GPF. The dual siphon flush system is both quiet and powerful. All parts required for the installation are in the pack, including the pre-fitted seat with stainless steel hinges. The toilet is WaterSense-certified. It has a five-year limited warranty on porcelain parts and one-year on the flushing system and seat. You don’t have to sacrifice style or function, even on a budget of under $500. The major toilet manufacturers have something on offer to suit all tastes.